Beauty / Health | OCT Inc. Using OCT’s own Hydrogen Ion. we’ve been doing R&D and Sales of beauty products with small- structured water and mild acidity and excellent bactericidal. Taking advantage of “Hydrogen Ion” and “Small-Structured Water Solution”, and its excellent permeability, OCT, Inc. has been researching to suppress the aging, keep moisture and make healthy skin. And we developed skin care products with its research results and own technology. and structure of water is small. Using Hydrogen Ion, OCT, Inc. has developed and sold drinking water and sparkling water with small-structure, excellent reduction and oxidation power; best for keep health and youth. OCT, Inc. has confirmed of its diuresis effect, absorption of medicine, enhancement of immune system, and reduction of side effects of Anti-Cancer Drugs based on the longtime study of “Hydrogen Ion”, and commercialized with own technology. From now on, we’ll update the research findings. We fed “tap water” and “OCT Hydrogen Ion Water” to each group of rats for 3 weeks, and measured the amount of active oxygen and anti-oxidation in the blood. 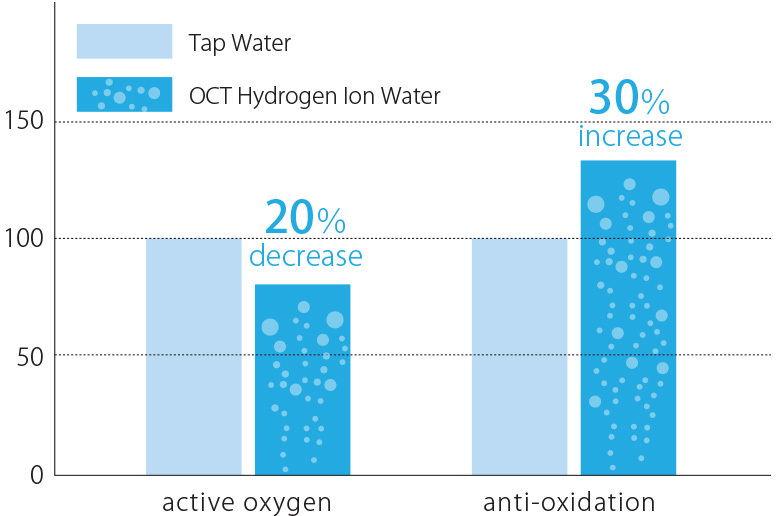 The amount of active oxygen of the group of “OCT Hydrogen Ion Water” decreased 20% and anti-oxidation increased 30%.